As a small business that constantly utilizes and enjoys Refugio State Beach and its surrounding areas as a destination for ecotourism and outdoor education, Santa Barbara Adventure Company is deeply saddened and conflicted by the oil spill on May 19, 2015. The spill has already resulted in devastating effects on the beautiful and beloved marine and terrestrial environment of this pristine section of coastline. In addition, there are undoubtedly numerous repercussions to yet be unveiled. Remembering the 1969 Santa Barbara oil spill that ensued from from carelessness and mismanagement on Union Oil Platform A in the Santa Barbara Channel, Tuesday’s spill presents itself as an unacceptable wake-up call. Santa Barbara Adventure Company supports our local environmental organizations such as the Environmental Defense Center, Santa Barbara Channelkeeper and the Community Environment Council in their heroic efforts to monitor, contain, and clean the spill, as well as prevent future oil developments. We hope that those responsible will put forth efforts to mitigate the consequences of this environmental tragedy. Refugio State Beach is a priceless piece of paradise that we hold dear to our hearts. Many come here to enjoy the serenity and beauty of nature, and to see it infected by black oil is tragic and devastating. 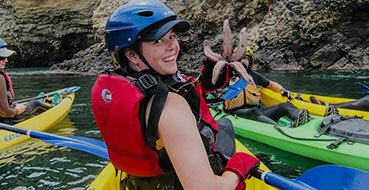 We have been leading guided kayaking trips, beach days, and outdoor education programs at Refugio for over 17 years. In 2014, we took 1400 people kayaking, and 1000 of them were school groups on outdoor education programs. Refugio is a magical place. Spending time there is our work, our play and our passion. The value of clean and protected marine areas like this is immeasurable, and the impact of this event is far reaching. What is the value of sunset at Refugio, or catching a green wave on the point? What is the value of children seeing migrating grey whales while kayaking or tidepooling? The economic impacts of this spill on our small business have been immediate and dramatic. With the busy summer season about to start we have cancelled dozens of kayaking tours booked for the next few weeks at Refugio State Beach. While these impacts are direct and measurable we are also receiving many calls from concerned visitors about the greater Santa Barbara region and how the waterfront is impacted. We’d like to point out that while this spill has devastated the marine environment around Refugio, the impact is limited to a 4 mile stretch of coastline located 23 miles north of Santa Barbara. Santa Barbara hotels and tour operators remain open for business and those with plans to visit Santa Barbara should not cancel their trips as there are many other unaffected beaches around Santa Barbara to enjoy. Photo by Cara Sottak – Refugio State Beach on April 20, 2015.